You will love to visit this medieval town with wonderful sea views in Liguria, Italy. This tower probably originates from the original Roman Fundus Pompey and was derived from the rustic adjacent buildings to the Costa Balenae mansio located close by. However, there is no document to date which can confirm the existence of that country before the eleventh century in the first millennium. Permanent exhibition of paintings, from 15th to 30th July. Pompeiana consists of several villages and the old town centers lie a short distance away from each other. The newer buildings have given this town a continuous and even optical look, although the much preferred and older districts are located in the remote parts of town. Among those districts are Conio in the east, Case Ssoprano, Barbarasa in the north and then Belli and Furnu in the south. On the western side there is a watch-tower behind the tower of Panei which was built in the sixteenth century to warn and defend against attacks; there is another village there (Costa Panera), which was abandoned after the devastating earthquakes which struck the western Riviera in 1831. The town lies eastwards of the Argentina valley and is about 36 km away from the capital city, Imperia. In 1049 the gully created by the still existent Santa Caterina River, which runs in the east of the country, marked the boundary of the country which Adelaide di Susa had allotted to the the Benedictine monks from the Santo Stefano cloister in Genoa. The city of Pompeiana is approx. 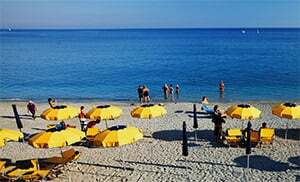 2 km away from the Ligurian Sea, behind Riva Ligure and is located centrally on the southern slopes of Monte Croce, a high hill of about 600 meters. Pompeiana’s favourable southerly location, its proximity to the sea and the hill in the background guarantee a mild climate all year round. You take the highway exit to Arma di Taggia and continue eastwards until you come to the junction in Riva Ligure where the SP50 branches off, leading you to Pompeiana.